Tune in May 3 @ 5pm CST, for another facebook live event of Joined At The Hip: Episode 3, hosted by Dr. Harry Kim & Earl Cole, with special guest, Dr. Tony Herring! This episode will focus on the upcoming ADULT PERTHES SURVEY (release date: May 1), and its importance to Perthes research. The survey will be available, worldwide, for all adults over the age of 18, living with the effects of Perthes disease. We want to better understand your Perthes journey and your current quality of life/health, since your diagnosis. This episode will contain great information for Adults with Perthes, Parents of children with Perthes, Clinicians, Researchers and Caregivers. You can view the Joined At The Hip live stream on the Perthes Kids Foundation facebook page (and IGTV @pertheskids), or the International Perthes Study Group facebook page. Both pages will be streaming this live chat and discussion, simultaneously. We look forward to your questions! You can submit your questions in the comments during the live episode, or you can email them ahead of time to info@pertheskids.org. We will address as many questions as we can within the timeframe of the episode. Thank you. Dr. Harry Kim is an orthopedic surgeon and Perthes specialist/researcher at Scottish Rite Children’s Hospital in Dallas, TX, and is the Founder & Director of the International Perthes Study Group. Dr. Tony Herring is an orthopedic surgeon who has been treating Perthes disease for over 40 years and is well-known as the pioneer of The Herring Classification, which classifies LCPD based on the height of the lateral aspect of the capital femoral epiphysis during the fragmentation stage of the disease. He served as Chief of Staff for Scottish Rite Hospital for 34 years and now serves as the Chief of Staff Emeritus. Earl Cole is the Founder & Executive Director of the Perthes Kids Foundation and Camp Perthes International. He is also a former Perthes patient, that was diagnosed at the age of 7. 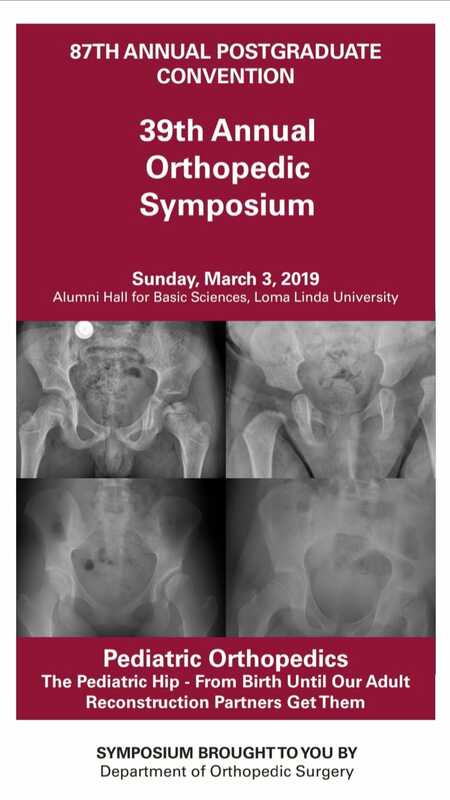 We had the honor of attending the Orthopedic Hip Surgery Symposium, at the Loma Linda University School of Medicine, which included informative presentations about Hip Dysplasia in Children and Legg-Calvé-Perthes disease, by two of our very own PKF board members, Dr. Rachel Goldstein & Dr. V. Salil Upasani. Perthes Kids Foundation will be attending Controversies in Pediatric Limb Reconstruction (CPLR), which will be held at Texas Scottish Rite Hospital for Children in Dallas, Texas on February 8-9, 2019. CPLR is an interactive symposium with a focus on Blount’s disease, congenital pseudoarthrosis of the tibia, congenital femoral and tibial deficiencies, Perthes disease and bone biology. 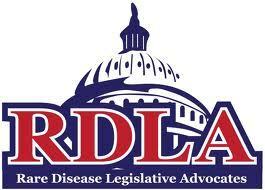 There will be a special presentation and discussion dedicated to Legg-Calvé-Perthes disease on Saturday, February 9th. 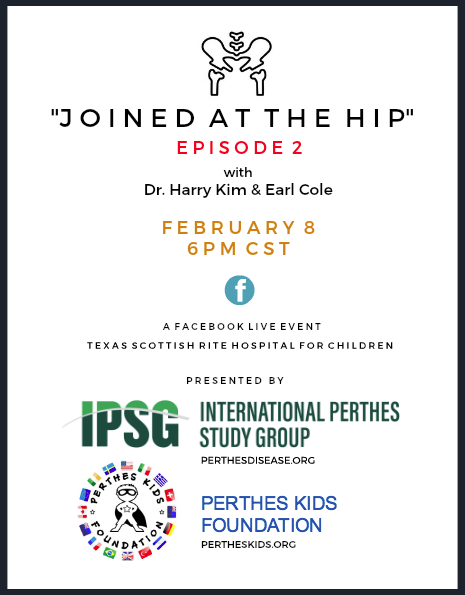 Tune in February 8 @ 6pm CST, for our facebook live event of Joined At The Hip: Episode 2, hosted by Dr. Harry Kim & Earl Cole. You can view the live stream on the Perthes Kids Foundation facebook page, or the International Perthes Study Group facebook page. Both pages will be streaming this live chat and discussion, simultaneously. We look forward to your questions! Perthes Kids Foundation is proud to, once again, participate in Rare Disease Day with our 2nd Annual Perthes Kids Art Contest! Last year’s contest was a big success, so we’re hoping to have even more Perthes Kids in 2019 to #ShowYourStripes through your creativity. For more information on how to participate, just click on the button below. There will be additional prizes for our top winners! Competition is for ages 7-15, but kids of any age may submit artwork to help raise Perthes awareness. Children 6 and under can download our optional coloring page. Every work of art will be displayed on our WALL OF ART in our Perthes Gallery. The submission deadline is February 21st…good luck to all! Through PKF’s partnership with Sony Pictures Entertainment, we are able to offer special prizes from the new Spider-Man: Into the Spider-Verse movie & other cool merchandise from other movies, as well! Our mystery grand prize will go to our top winner of this year’s AMAZING scavenger hunt. In order to play, find as many items from the following list as possible. Get creative! Take a selfie with your items (or have someone take it for you) and send to info@pertheskids.org. This email is the ONLY place where submissions will be accepted! Only one submission allowed, so all photos must be part of the one submission (use attachments, not multiple emails). You should try and combine as many items as you can in a single photo (*please do not submit more than 5 photos). Make sure all items are clearly visible in photos. Please include name, age, perthes hip, location, and number & name of items found. Kids with the most correct items, submitted in the fastest time, win a prize! Only a select number of prizes are available, but every participant will get their best or funniest photo added to our PKF gallery and/or social media channels. Photos must be taken on January 5 and/or 6, 2019. Contest is for ages 3-17 only. 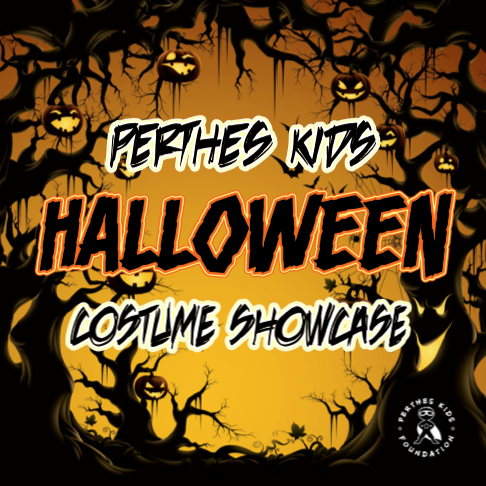 parents/siblings are not allowed to “physically” help with the searching, unless perthes kid is in casts or wheelchair, or under 7 years old. perthes kid must physically appear in all photos with items. submit photos (no more than 5) to info@pertheskids.org with “perthes scavenger” in the subject line, and name the specific items in each photo. Contest begins Saturday, January 5 @ 10am PST. The item list will be posted at that time right here on our website, as well as, announced in our perthes support group on facebook. We will also include a list of some of the prizes. Contest ends Sunday, January 6 @ 7pm PST. No submissions allowed after time. the top 10 finishers win a prize. All others still get their photo published! Winners announced on Friday, January 11, and prizes shipped out soon after. Are you ready? Get set… GO!!! *The countdown has begun. You have 33 hours to complete your list. Wow, the facebook community raised over $125 million for causes on #GivingTuesday (Nov 26, 2018)!!! So grateful to be included in this very worthy cause, no matter how small or rare! 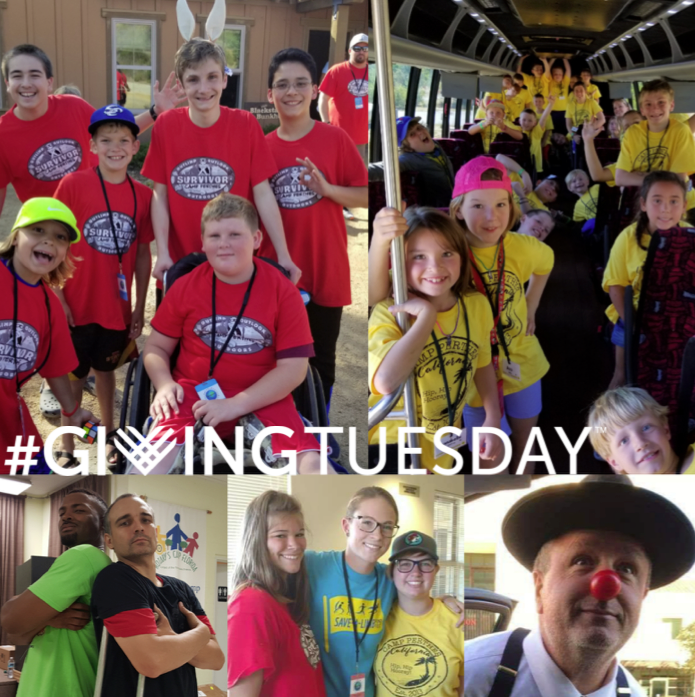 Thank you to ALL for your #GivingTuesday contributions through facebook and the pertheskids.org website. 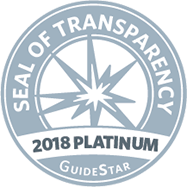 We were so honored and humbled to see all of the many fundraisers created, or shared, on behalf of Perthes Kids Foundation! 💗 Because of supporters like you, we stay super motivated in our mission, to raise global awareness and provide resources & support for children, adults & families, affected by Legg-Calvé-Perthes disease. 100% of the funds will be used for our ongoing Perthes advocacy and research efforts around the world. So a big THANK YOU once again, for the love and support on #GivingTuesday and beyond! "This is what Perthes looks like." 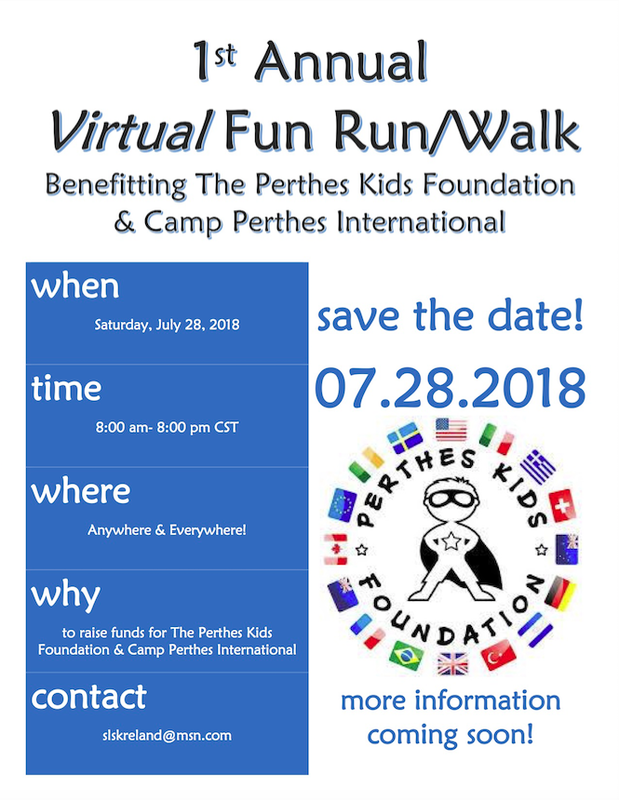 1st annual virtual fun run/walk for perthes kids! Whether you walk or run, pedal, ride, or roll, everyone can participate, no matter what age, no matter where you are in the world. Choose your path, your distance, and show your support. Even if you're already a daily runner/walker, just be sure to "do it for Perthes" on July 28th! DON'T FORGET- post a picture of yourself or your group on our fundraiser page (or email it to us) - we want to see YOU and see how far our mission has reached! Sign up today and walk/run for all the Perthes Kids and Legg-Calve-Perthes disease, around the world. Again, you can enter either through our facebook page, or make your donation right here on our website. Just make sure you mention "Fun Run/Walk for Perthes"! Thank you for your support. Good luck! CLICK ON IMAGE, DOWNLOAD & PRINT!